MOSCOW, September 19. /TASS/. 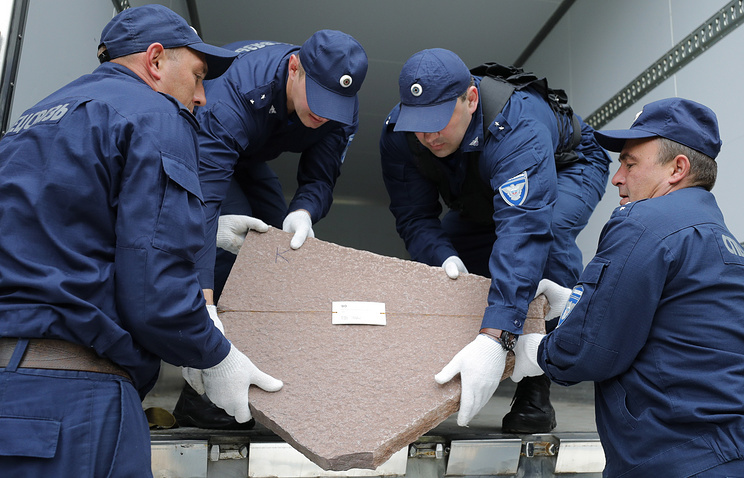 Natural stones from Russia’s regions that are connected with the history of Soviet-era repression in the 20th century were handed over to sculptor and author of the memorial dubbed "The Wall of Grief", Georgy Frangulyan, on Tuesday. The delivery of 170 stones from 58 regions was organized by the Memory Fund. "People who are not indifferent answered our call and collected the stones. Some of them had to be pulled out from the bottom of the Rybinsk Reservoir," head of the Gulag History Museum and Memory Fund Roman Romanov said. "There is history behind every stone," he stressed. President Vladimir Putin signed a decree to create a monument to the victims of Soviet political repression in autumn 2015. Out of 336 projects that were presented to the competition, the jury selected the one by sculptor Georgy Frangulyan. The centerpiece of the monument is formed by many human figures soaring into the sky. On the sides of the Wall there will be panels inscribed with the word ‘remember’ in different languages. The square in front of the memorial will be paved with stones brought from the regions where Gulag camps and prisons were located. The opening of the memorial that is now being constructed at the intersection of the Garden Ring and Akademika Sakharova Prospekt is scheduled for October 30, 2017, that is on the Day of Remembrance of Victims of Political Repression.